So today I decided that I have suffered enough… 14 months. I’ve decided to take Zoloft at 25mg to start. It may make things better, it may make things worth however, at this point in my recovery I have nothing to lose because my depression is getting worse by the day. Thank you everyone for your support and listening to my rants. I’ve tried everything to stabilize… maybe some people who did the same will chime in and give me some hope. Re: "Big pharma MD's killed my father"
My dad had the same symptoms as the dad posted here. He never takes drugs, and it was a hospital visit for dehydration that turned into pneumonia and he died. He was a doctor and always told me as a kid, if you want to kill yourself, just check into a hospital. So that warning turned out to be true. BTW, I believe he was beginning to suffer from Dementia even before he went to the ER…..And his wife was his advocate, as well as an NR. Sometimes I think MiA is bit much. I concur. Sometimes MiA is way too much. There are a lot of professionals there speaking out about the dangers of these meds, but some of these professionals used to be conventional psychiatrists who prescribed a lot of these same medications in the past, and then got disillusioned with their field and adopted a different stance. It is good to see differing opinions, but this is all way too confusing to an average person in a situation like this. Some MiA articles sure cause a lot of cognitive dissonance in both doctors and patients. I guess, I just don’t like the absolutist stance on issues such as medications. Heck, even Dr. Peter Breggin used to prescribe Librium during his psychiatric residency. Obviously, even he must have believed that psychopharmacology worked before he became medication skeptical….. 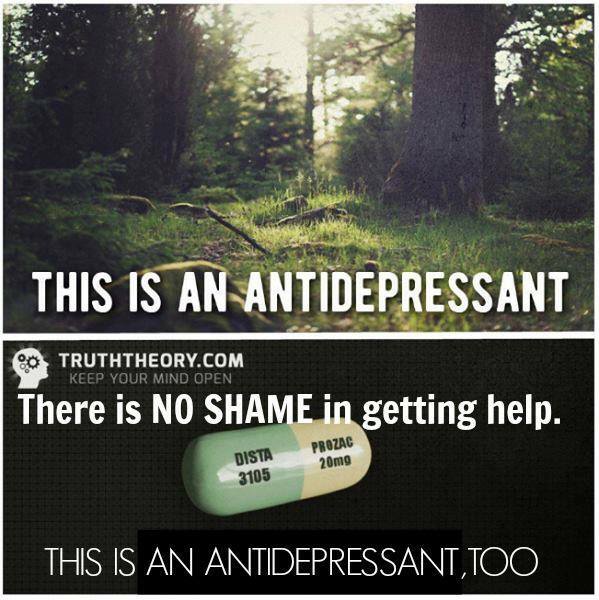 I notice a trend of a lot of antidepressant bashing over at the MiA. I wonder if that is because there is a little less stigma and controversy about antidepressants then about some other psychotropics. I don’t advocate antidepressant use, but I find it interesting how much antidepressant backlash there has been in the last 20 years, while the other meds were hardly being even mentioned. While so many were bashing Prozac and Zoloft, people were being prescribed Lamictal, Trileptal, Risperdal, Tegretol, Zyprexa, Ativan, Xanax, Klonopin, Gabapentin, Seroquel. Just saying….. 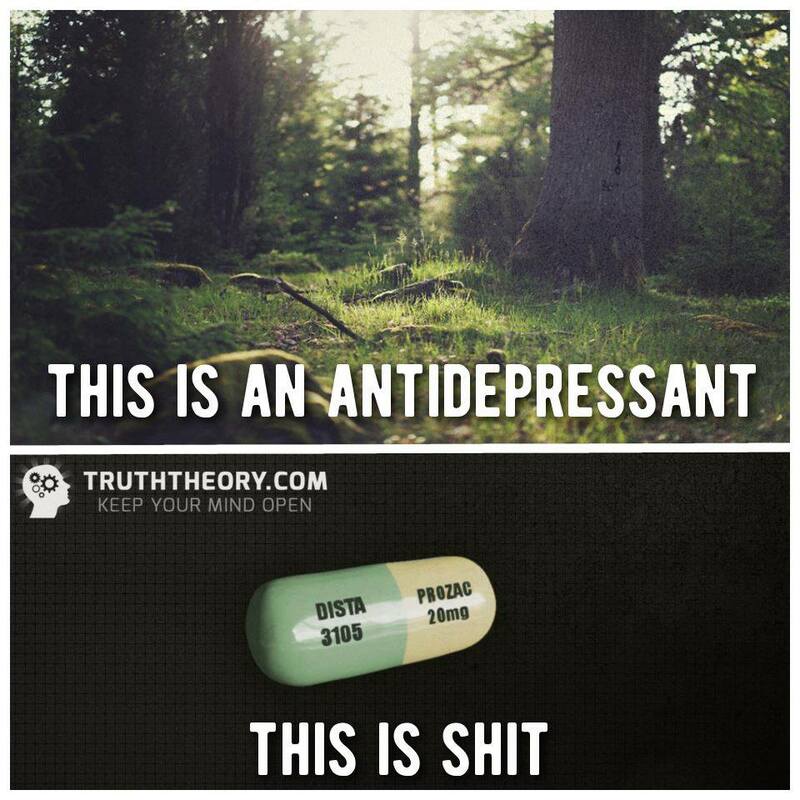 It makes me wonder how many people looked at the anti-depressant backlash, and kept thinking “Why should I take antidepressants when anti-anxiety meds have been there for years, and I am more anxious than depressed?” It is very easy to get into that sort of mindset. I think Robert Whitaker correctly points out that people are terribly confused about psych meds due to all these different schools of thought. Even though it is a UK petition, signatures are being solicited, at secret online sites, not only from UK, but also from U.S. and Canadian, citizens. At last count they had 604 signatures. Their goal is 1000. One of the doctor-bashing groups claims to have over 1500 members but can’t even rouse a significant percentage of its members to sign the petition (they don’t have 1500 active members). Benzo Buddies claims 28,000 members but over 90% of the listed membership never posts, or has posted once, and ran from the site screaming (it is rumored Benzo Buddies even keeps deceased members on the membership rolls). If Benzo Buddies had that many members it would be very easy to get 5,000 of them to sign a petition that bashes doctors — some movement. It is as fake as their claims Big Pharma targeted them. That is to say, out of a combined total population of 419 million only 604 people signed this garbage. What percentage is that? Pathetic is not even the right word to describe this. Medication helps people live productive lives. David Greene talks to Kitty Dukakis and her husband, former Mass. Gov. 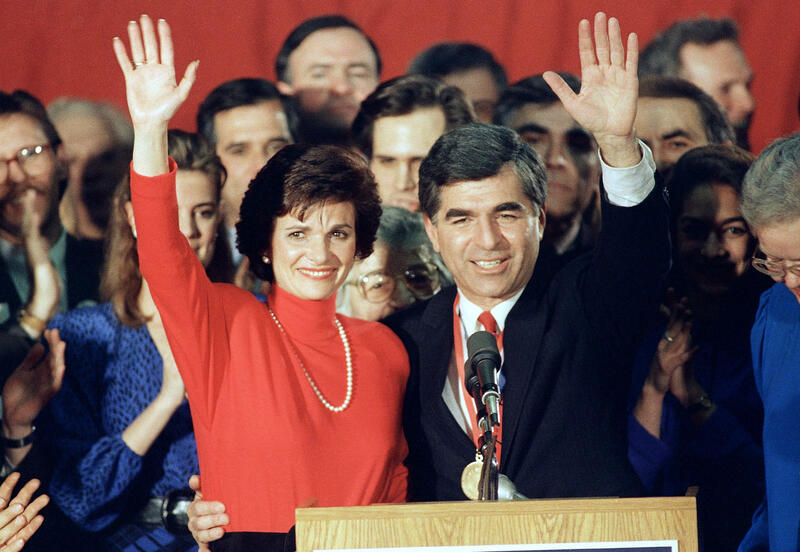 Michael Dukakis, about their campaign to destigmatize electroshock therapy. She has used it to alleviate severe depression. So I just called Roche Pharmaceuticals, the company that produces/makes Klonopin. I explained to them that I am going to be tapering off Klonopin and wanted some advice. They WOULD NOT help me and could care less when I told them some of the discontinuation effects that klonopin has on people. They told me it was out of their control and they also could not help with a taper plan. I explained to them that my doctor did give me a taper plan that was a little too rapid for me in the past and I am preparing and I just wanted a second opinion before I started my taper. I told them I was calling them for a second opinion since they make the pills and know how the pills are chemically produced. The answer was exactly as the “I’M SORRY, WE CANNOT HELP YOU”. Anyway, if I ever doubted benzobuddies in the past, now I really don’t. You were all right from the beginning. Doctor’s pharmaceutical companies and all the rest of them are completely helpless and useless. I guess it is up to us to be our own doctors and just help our selves and hope for the best. Sorry, I just needed to vent. ROCHE PHARMACEUTICALS are pure evil!!!!!! 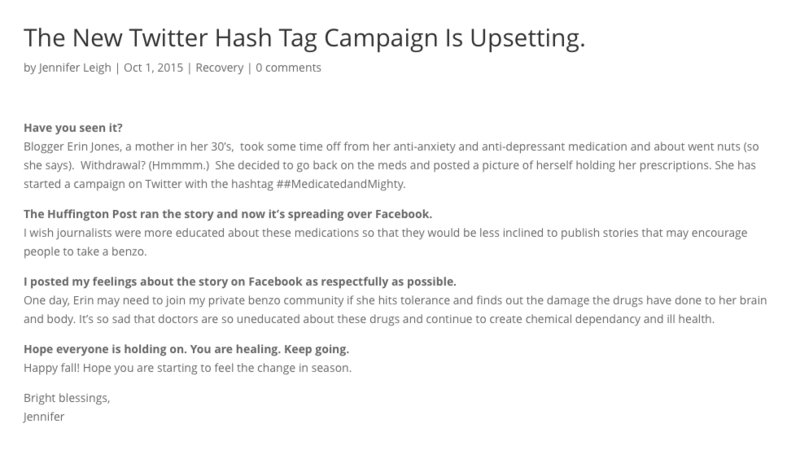 Is the Twitter hashtag #MedicatedAndMighty the reason she closed down?